Now he is ready, and we are very proud of him: Our new octocopter for perfect photo and film shots is also the largest one we have ever designed and built. high-quality equipment up to 12 kg stable in the air. We have also designed this octocopter to differentiate ourselves from the numerous providers you’ll find on this market. You won’t find an octocopter like ours, even in Europe, capable of carrying such a heavy load. We worked for three months on the CAD (computer-aided design) to realize this unique drone. During this time a detailed plan for the construction of the octocopter was designed. Starting with the camera mounting, the LED position lights right up to the control board that regulates the speeds of the individual motors – everything was designed and calculated on a digital drawing board. After another three weeks of production and many tests the octocopter was ready to fly for the first time. The entire drone is made of carbon fiber, a material made of industrially produced carbon fibers, which is perfect for constructions of this kind, due to its own low weight and high stability. We no longer have problems carrying heavy, high-quality equipment in the air. Our new drone is particularly suitable for the transportation of the red epic drone, which delivers brilliant shots up to 6 K – this means a nine times higher resolution than the conventional HD technology. 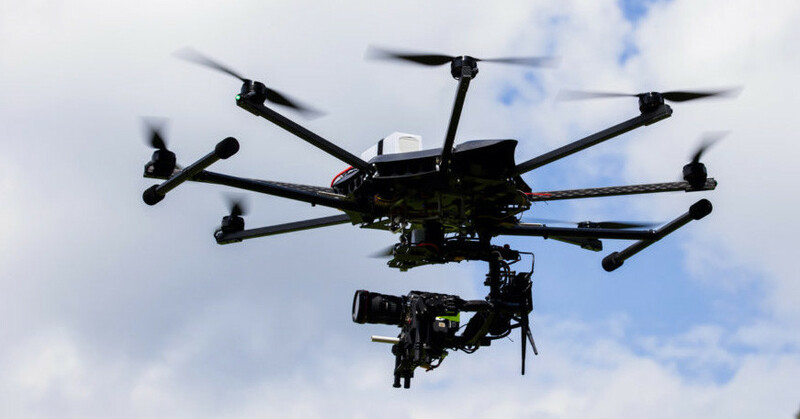 Even the Alexa Mini, a comparatively small camera with a 4K sensor in Super 35mm format, or an Ultra Prime lens with the biggest zoom range are no problem for our Octo copter. We are very well prepared now for professional filming and high-resolution photographs, because our octocopter is steady in the air, as it is designed for additional 12 kg.